Restaurante en San Telmo | #1 Bodegón en Capital Federal - Llamanos! 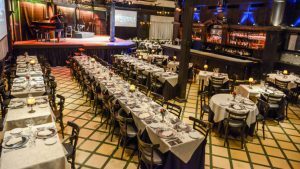 Located in the heart of Buenos Aires’ historic quarter, El Querandí has one of the best gastronomic and tango proposals in the area. On the other hand, our restaurant in San Telmo is known for respecting with the utmost fidelity the magical atmosphere that characterized it in the early years of the twentieth century, adding, of course, excellence in customer service, amazing regional dishes, and a spectacle of authentic Argentinean tango. Our imprint, crossed from beginning to end by tango, that inimitable cultural and musical expression, has a long tradition in the city. Our kitchen stands out for the high quality of the products it uses, and for the typical of its menu, which of course, falls like a fingertip to this typical Caserón in San Telmo. The menu of El Querandí offers its guests the most exquisite Argentine specialties, from the unforgettable Chorizo Beef, to the daring tasting of Argentinean casseroles, passing through the typical northern humita or the surprising tiramisú de yerba mate. We accompany the menu with a wine list that also aims to be a federative proposal of grape varieties and regions of our renowned Argentine wines. For all these reasons, El Querandí is deeply proud to be considered one of the best restaurants in San Telmo, Capital Federal, precisely for offering more than good food. El Querandí was carefully restored, respecting with zeal its origins in the early twentieth century, which meant maintaining its Art -decó façade, its chess floors, its boiserie of dark tones, its Solomonic columns and its arches and shields, all this transports us to another era, it is a place that tells stories, which sincerely respects its long tradition, and which induces unforgettable moments in the history of the city. In addition to savoring exquisite dishes, El Querandí is the only tango shop that presents a show that proposes a tour through the history of tango in blocks of time, from its beginnings “Arrabal y fandango”, to the frenzy of “Piazzolla’s Modernism”, passing through the unforgettable “Gardel y su tango canción” and then the “golden age” with the great orchestras. In this way, an atmosphere of memories and vivid emotions is generated that will undoubtedly last in the memory. Copyright © 2018 - El Querandí..